I’m the new kid. I am tuf. This morning I beat up a kid. Fighting, fibbing, making trouble… While his dad gets cancer treatment, Dexter seems to be going off the rails. It’s only the first day at his new school, but he’s already mad at the principal, the secretary, the janitor and the kids who laugh at him. So when his teacher tells the class to write a story, Dexter writes about how tough he is – and how he’s already gotten into a fight. Is any of Dexter’s story true? 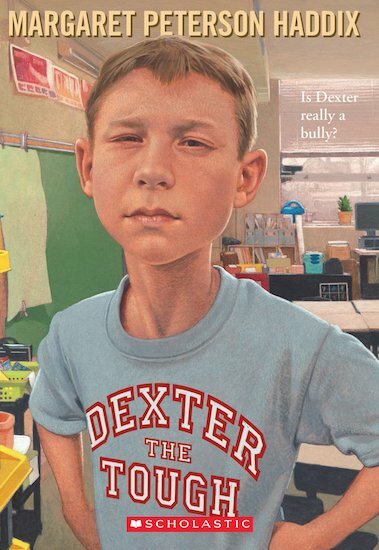 Why was the other boy crying before Dexter hit him? And why would he still want to be Dexter’s friend? Even Dexter doesn’t know the answers to some of those questions. But as he deals with family problems, a nosy teacher and a boy who’s strangely interested in floor wax, he discovers many surprises hidden in his own tale.